At the aftershow party following Bob Seger’s near sell-out gig at Rogers Arena last night (March 27), his longtime saxophonist Alto Reed–best known for the stirring intro to “Turn the Page” and the party-hearty solo on “Old Time Rock and Roll”–was asked about Seger’s recent claim that he’s about ready to quit the road for good. Reed just kind of rolled his eyes and shook his head, giving the impression that his boss wasn’t anywhere close to putting the Silver Bullet Band out to pasture. And judging by the show that Seger and his 13-piece group had just put on, why the hell would he? “Get Out of Denver”, “Ramblin’ Gamblin’ Man”, “Rosalie”, “Still the Same”–those are just a few of the Seger classics that he didn’t play last night, but their omission left little cause for complaint. Neither did the crowd seem bothered by the fact that, of the 17 originals he did do, all but four were from the seventies. The brunt of the material came from the albums Beautiful Loser (’75), Stranger in Town (’78), and especially Night Moves (’76). 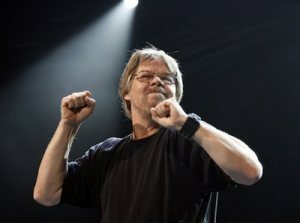 Though his own performance was impressive throughout, Seger got tons of help from an ensemble that included two guitarists, a bassist, a keyboardist, a drummer, three backup singers, and five horn players–including the aforementioned Reed. Strangely enough, the current lineup includes two guys from Grand Funk Railroad, drummer Don Brewer and keyboardist Craig Frost. Yes, it’s an American band. Besides his tried and true hits like “Beautiful Loser”, “Katmandu”, “Roll Me Away”, and the evocative “Night Moves” (which opened his second encore), Seger made great use of smokin’ O.P.’s (other people’s songs), kicking things off with John Hiatt’s rollicking “Detroit Made” before getting super-funky with Otis Clay’s soul gem “Tryin’ to Live My Life Without You”, which he’d previously recorded on the live album Nine Tonight. The set’s other cover was a captivating version of Wilco’s “California Stars”, from its 1998 Mermaid Avenue disc. As if a hefty dose of Bob Seger weren’t enough to satiate local ’70s-rock freaks, opener Joe Walsh brought all his riff-driven goodies from 40 years ago as well, including “Rocky Mountain Way” and the James Gang hits “Funk #49” and “Walk Away”. His show was basically an arena-sized version of the one he did at Coquitlam’s Red Robinson Show Theatre last September–and with some of the same jokes. Before playing his much-loved solo hit from ’78, “Life’s Been Good”, Walsh again apologized to anyone who may have been forced to hear it through repeated plays by their parents. I can think of worse things to suffer through.